A selection of papers. Preface. Acknowledgements. I-Overviews. Use of high pressure in bioscience and biotechnology (R. Hayashi). II-Biochemistry and Molecular Biology. High pressure effects on the structure and mesophase behaviour of supramolecular lipid aggregates and model membrane systems (R. Winter). Morphological effects of pressure stress on yeasts (M. Osumi et al.). Gene expression under high pressure (C. Kato, K. Horikoshi). Effects of hydrostatic pressure on photosynthetic activities in thylakiods (M. Yuasa). Changes of microfilaments and microtubules of yeasts induced by pressure stress (H. Kobori et al.). Acquisition of stress tolerance by pressure shock treatment in yeast (M. Miyashita, K. Tamura, H. Iwahashi). High pressure denatured metalloprotein is a new NO-trapper (T. Oku et al.). III-High Pressure Effects on Biological Structures. Pressure-induced molten globule states of proteins (P. Masson, C. Cléry). High pressure NMR study of protein unfolding (T. Yamaguchi, H. Yamada, K. Akasaka). Structure of pressure-induced "denatured" state of proteins (N. Tanaka, S. Kunugi). Finite element study of protein structure under high pressure (T. Yamato). Pressure-induced dissociation of beef liver L-glutamate dehydrogenase (G. Tang, K. Ruan). Effect of pressure on the phase behaviour of ester-and ether-linked phospholipid bilayer membranes (S. Kaneshina, S. Maruyama, H. Matsuki). Structure and function of nucleic acids under high pressure (A. Krzyzaniak et al.). IV Enzymes. Enzyme stability under high pressure and temperature (S. De Cordt et al.). Thermodynamics of transient enzyme kinetics (C. Balny). V-Microorganisms. High Pressure inactivation of microorganisms (H. Ludwig, G. Van Almsick, B. Sojka). Behaviour of Escherichia coli under high pressure (K. Tamura et al.). High pressure inactivation in foods of animal origin (M.F. Patterson et al.). VI-Food Science. Advantages, opportunities and challenges of high hydrostatic pressure application to food systems (D. Knorr). Effects of high pressure on dairy proteins: a review (J.C. Cheftel, E. Dumay). The effect of high pressure on skeletal muscle myofibrils and myosin (A.J. McArthur, P. Wilding). Effect of high pressure treatment of proteolytic system in meat (N. Homma, Y. Ikeuchi, A. Suzuki). High pressure effects on emulsified fats (W. Buchheim, M. Schütt, E. Frede). High pressure treatment of whey/polysacchride systems (P.B. Fernandes, A. Raemy). Gelation of surimi pastes treated by high isostatic pressure (T.C. Lanier). Thermal and rheological properties of pressurized carp meat (N. Iso et al.). Effect of hydrostatic pressure on the sterilization of tomato juice (T. Sato, T. Inakuma, Y. Ishiguro). Texture and cryo-scanning electron micrographs of pressure-shift frozen tofu (M. Fuchigami, A. Teramoto). Sterilization of yeast by high pressure treatment (Y. Aoyama et al.). Application of high pressure for sterilization of low acid food (K. Kimura et al.). Modeling of high pressure thawing (J.M. Chourot et al.). Continuous high pressure systems for liquid food (S. Itoh et al.). Development of a pulsatile high pressure equipment (S. Itoh et al.). The effect of pressure on process modelling the Maillard reaction (N.S. Isaacs, M. Coulson). VII-Concluding Remarks. Some reflections on a high pressure conference (K. Heremans). List of Participants. Author Index. Subject Index. For many years, pressure was disregarded by biochemists. Today, there is a growing interest in pressure as a variable acting on biosystems. 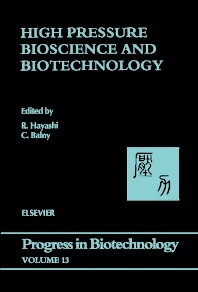 The activities that are currently of interest to scientists working in the field of High Pressure Bioscience and Biotechnology have been well presented in this volume, with topics ranging from physical biochemistry, microbiology, molecular biology and food science to industrial application. The editors have been successful in promoting the possibility of applying pressure in specific biotechnological areas, not only for food processing but also for biotechnology in general. These proceedings present an up-to-date view of high pressure research and will contribute to future developments in this field.